The BoXeR would have been available as a complete system. Processor: Supports 040 up to 060 from 25Mhz to 75Mhz, plus optional PowerPC expansion card. Hard Drive Controllers: 2 x 3.5" Ultra DMA/33 IDE Controllers. Uses "Coin" shaped battery for newer motherboards. The BoXeR was an attempt to bring the Amiga up to date (in its time), and cheaper by using more standard PC style components. 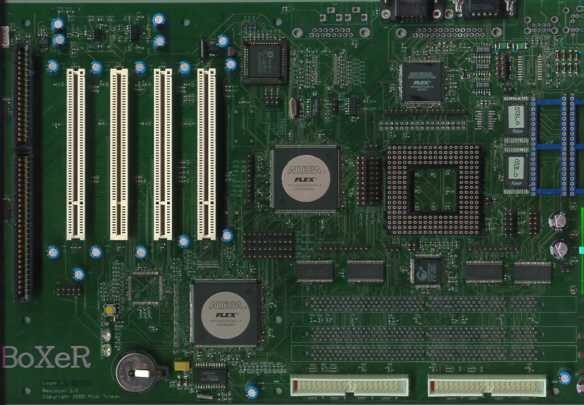 The motherboard was ATX form factor which meant that it could be mounted in most PC cases, and infact the intention was to sell the motherboard on its own for end user installation, as well as dealers providing complete BoXeR systems. It also made use of standard PC PS/2 keyboards & mice, as well as ordinary PC 1.44MB floppy drives, although it is unknown whether it would read native Amiga disks. Earlier versions used ISA slots instead of Zorro II or III for cheaper expansion cards, but later motherboards moved to PCI once it became clear that PCI was pretty much becoming universal. The motherboards could take either an 040 or an 060 ranging from 25Mhz to 75Mhz and later it was decided to add support for an optional PowerPC processor to run software intended for use with Phase 5's PowerPC accelerators. However, whether this PowerPC option was ever added to any of the motherboards is unknown. 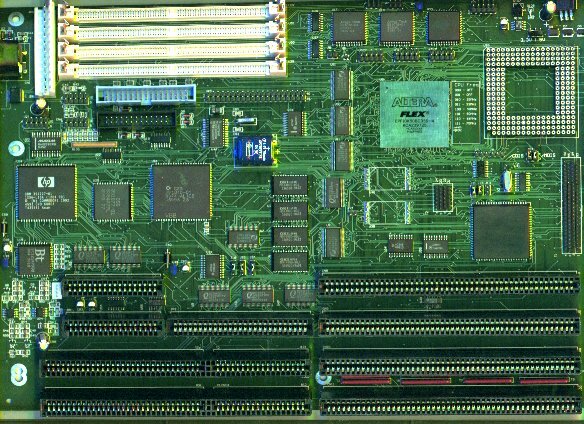 The BoXeR used a cloned version of the AGA chipset which was largely contained within a single chip, but had none of the Chip RAM limitations associated with AGA (2MB) and other Amiga chipsets. The BoXeR also had a 2MB FlashROM on the motherboard, which may have held Kickstart (or whatever BoXeR equivalent) and possibly built-in drivers CD-ROM support. 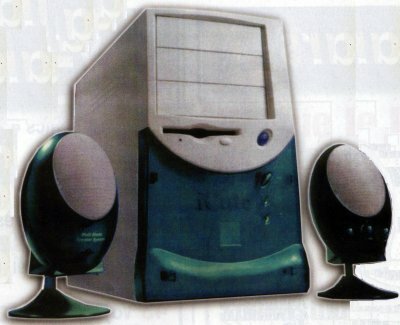 Unfortunately the BoXeR had a very long development cycle, largely due to the constant upgrading and tweaking of the motherboards with constant promises of release dates. Eventually the manufacturer ran out of money and the project was shelved.